There is nothing like a private Lake House while you are hunting, fishing, or just spending time outdoors. And with our beautiful new Lake House, you will be in touch with nature while enjoying all the amenities of home. 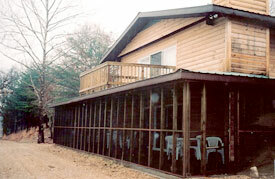 Our new Lake House sleeps up to 6 people comfortably while offering central air and heat. It features one-and-a-half bathrooms, spacious kitchen quarters (includes refrigerator, oven, microwave, coffee maker, pots & pans, all utensils and a table for 8), comfortable living room with satellite TV and a beautiful fireplace to enjoy. All bed linens and bathing towels are also provided. Two of the nicer aspects of the Lake House are the second floor walkout porch and the spacious outdoor screened in area on the main level. Both can be used to view the game approaching the lake, located just fifty yards away. The lake is well stocked and our guests are invited to try their luck with the Bass, Bluegill, Crappie, or Catfish. The lake is catch-and-release, and Don’t Forget to bring your own Tackle! Cost is $100 per person, per night. You can include meals for an additional $50 per person, per night. No pets allowed. The Lake House is available, during the months of May, June, July and August, for a Family Summer Vacation.